Needless to say, it didn’t take long for me to throw Steak into the car and veer through East London traffic to see whether Kinkao Korean would be the Korean restaurant that we had been waiting for. To begin, we ordered a plate of Korean Fried Chicken Wings – doused in a pool of sweet chilli sauce. The chicken – conveniently boneless, was crispy and relatively soft, whilst the sweet chilli sauce – though bold, sharp, and sweet, proved to be rather gloopy and grainy, which made it a little difficult to finish them off in a single sitting. (Rest assured however, the leftover chunks of chicken made for a rather enjoyable lunch the next day). By contrast, the honey butter and garlic fried chicken wings we ordered at a second visit were far better. The wings were tender, crispy, and juicy, and the honey butter and garlic sauce in which they were doused was beautifully aromatic, with a rich, yet subtle sweetness. We also tried the “Saewoo Kan Poong Gi” – crispy king prawn tempura in a chilli plum sauce. Here, the thick and juicy prawns contrasted perfectly with the crisp batter, whilst the sharp kick of the chilli plum sauce left our tastebuds coming back for more. However, when we tried the chicken equivalent – (“Kan Poong Gi”) at our second visit, the chicken had been rather overcooked, resulting in a chewy texture that nearly dislocated my jaw. Perhaps this was a one off, but if you’d rather not take the risk, order the prawn-based Saewoo Kan Poong Gi instead, and you’ll still get to try the sharp and sweet chilli plum sauce. Having underestimated just how generous the portion sizes would be, we had also ordered a plate of prawn gyoza. To our surprise, each dumpling carried a deep “fried aroma”, but without any of the heavy greasiness that one would expect. Together with the tender prawn filling within, these little fried dumplings were a delight to eat. For mains, we had ordered just one beef bulgogi bibimbap, and when it arrived, we were rather glad we hadn’t ordered anything more. A huge, sizzling hot stone bowl of rice, vegetables, and beef bulgogi stood before us, topped off with a single raw egg, and served with a bowl of chilli sauce. After remarking that I cannot be trusted with a spoon, Steak proceeded to pick one up and go “stir-crazy”, pouring in the accompanying sauce as she went along. As the rice, vegetables, and protein began to cook, crisp, and lightly char, the intense aroma began to fill the room, prompting nearby diners to glance over. (Perhaps to check whether the suspicious brown man in the corner was about to explode). Each and every bite of the resultant bibimbap was heavenly to say the least, as the soft rice meshed in with the sweet and tender bulgogi – a rich pear marinade instantly evident in its concentrated flavour, whilst the heavy aroma wafted across the palate. At our subsequent visit, I decided to try the “Kalbi” – BBQ beef ribs marinated in a fruity soy sauce. Despite a relatively thin cut, the chunks of beef remained fantastically tender and succulent, and oozed with a sweetness that was rich and layered. Steak meanwhile, opted for the salmon teriyaki, which was thick, soft, and subtly sweet, but offered nothing that was particularly memorable. Generally, starters cost around £4 to £8, whilst main dishes cost between £9 and £12, and these prices are paired with some seriously hefty portion sizes. Our own meal amounted to £30 for two (£15 each), and after stuffing our faces, we (and by “we” I mean “I”) still had some leftover bibimbap and KFC to take for lunch the next day. When it comes to service, you should find that staff members at Kinkao Korean are very friendly and helpful, though, it can take a while to grab their attention. Those who have dined at Kinkao’s previous incarnation as a Thai restaurant, will no doubt have a bit of deja vu with the decor – given that it hasn’t changed at all. In fairness, there is perhaps no need to reinvest in new furniture, but the restaurant could certainly do with a bit of fresh paint and a little more light. Kinkao Korean can be found a ten minute walk away from Shoreditch High Street station, and some pay and display parking is available on nearby roads. Restrictions generally vary, with some ending at 5:30pm, some at 6:30pm, and others at 7pm. Like many a new venture, Kinkao Korean is not entirely free of flaws. 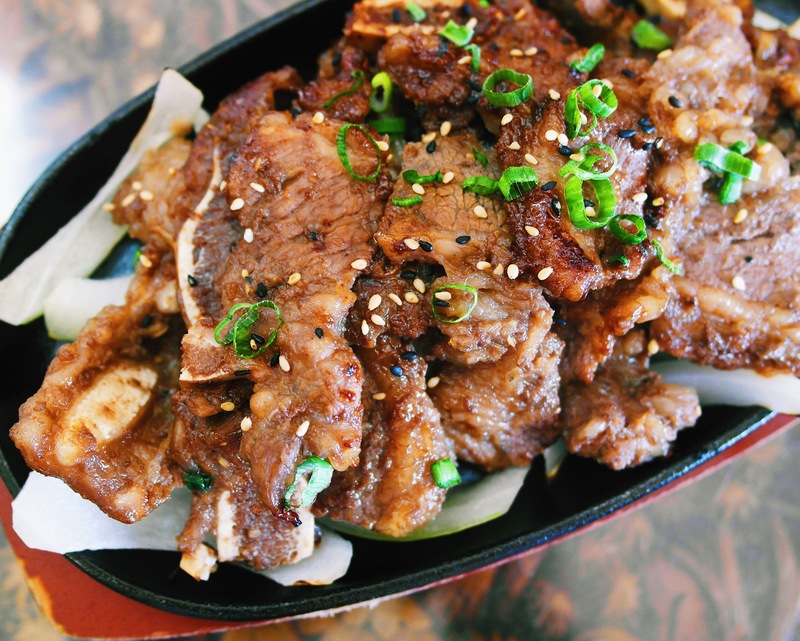 But, as essentially the first “completely Korean” restaurant in London with an entirely halal selection of meats, they offer a taste of Korean cuisine that simply must be tried. I for one will certainly be returning to feast on the rest of their menu, and I can now relax in peace and hopefulness, that we will at last begin to see a greater number of halal Korean restaurants in the UK. Halal status: All the meat served here is certified halal. Alcohol is served on the premises.